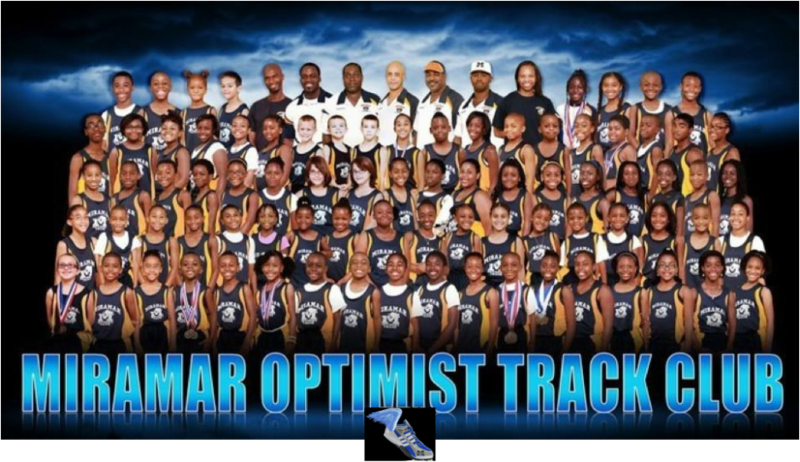 The Miramar Optimist Track & Field program was the first youth track program in the City of Miramar. We were founded in February of 2000. Our colors are Navy Blue & Gold!!! Our club has helped hundreds of children reach their potential in many areas of Track & Field, as well has other sports. We have produced many champions at the Local, State and National Levels within the last 7 years. Since 2000 our club has qualified hundreds of athletes to attend the National AAU Junior Olympics and we plan on continuing this trend in our 2013 Track Season! If your child just needs to lose weight or to stay in shape for football, basketball, baseball, soccer etc. Our Track program is here to help them. Our staff consists of highly trained coaches so your child can receive nothing but the best training possible. We will make this learning experience fun for your child, at the end of each season we have a Track banquet were each child is rewarded for his or her hard work! We hope to see your child on the track soon! This organization services youth ages 4 to 18 Years Old. This program is designed to meet the needs of all participants regardless of their age or performance level. The individual who makes the attempt is as much a part of the group as he or she who may attain the highest level of achievement. To provide the opportunity to further skill development and development of personal relationships. To develop such values as fair play, ethics, leadership, integrity, accountability and the pursuit of excellence. To establish and maintain an environment that values cultural diversity and gender equity among its athletes, coaches and officials. To develop and maintain physical fitness. To bring out the spirit, pride and enthusiasm of participants and spectators. Our Coaches/Board Members are a group of dedicated volunteers with the desire to help young runners. We are a developmental program for young athletes.